In 2015, a growing number of consumers began to take their nutrition seriously as part of an overall wellness, anti-aging and anti-disease strategy. Many of us started to focus on real, whole, unprocessed foods full of natural goodness as a way to take control of our health. In March 2015, the World Health Organization recommended a greatly reduced sugar intake, which was wholeheartedly supported by the American Heart Association and the American Stroke Association as a major advance toward improving global health and reducing chronic disease. As a result, the high sugar diet trend fortunately began to wane, as more and more health oriented people realized the associated risks of their individual sugar intake, including obesity, diabetes and increased risk of heart disease and premature aging. Also in 2015, we saw a rise in consumption of gluten free products, grass fed meats and dairy, heirloom beans, time-honored ancient grains and Non-GMO organic foods. 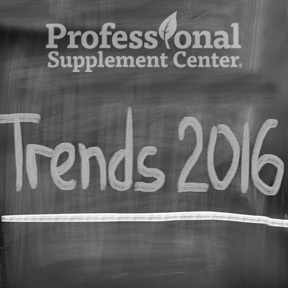 It was projected at the Academy of Nutrition and Dietetics’ 2015 Food and Nutrition Conference and Expo held in October that these healthy eating trends will continue in 2016. Real nutrition, as opposed to fad dieting, continues to gain momentum along with a focus on foods that promote health rather than foods that prevent health. What other trends will we see this year? Functional foods – While it should be noted that, strictly speaking, all food should provide the nutrients and energy necessary for survival, functional foods are defined as foods that have a potentially positive effect on wellness beyond basic nutrition. As part of a balanced diet and a healthy lifestyle, functional foods may aid in promoting optimal health, helping to reduce the risk of, or enhancing the ability to manage, chronic disease, thereby improving quality of life. Functional foods look beyond survival to identify and correct nutritional deficiencies and provide the components in quantities necessary not only for proper growth, development and maintenance but also for an improved state of health and wellbeing. Functional foods are foods that contain specific minerals, vitamins, fatty acids or dietary fiber or nutraceuticals that provide biologically active components such as phytochemicals, antioxidants or probiotics. Full fat Dairy – Growing evidence and research show there is no association between full-fat dairy and obesity, type 2 diabetes or cardiometabolic risk. While the debate between low-fat and full-fat dairy continues on, consumption of whole-fat dairy is on the rise as part of the overall whole, natural, healthy food trend. Dairy foods provide numerous health benefits and dairy fat contains healthy compounds, including conjugated linoleic acid, that are stripped from reduced fat dairy. Research suggests full-fat dairy may actually decrease the risk of coronary heart disease, metabolic syndrome and obesity. Low-fat anything is out –Now that we know that low-fat does not necessarily mean a product is healthier, consumer demand is reshaping the food industry. Expect to see fewer low-fat foods, as consumer awareness of the health benefits of certain fats and oils continues. Good fats such as fatty fish, nuts, seeds, coconut, olives and avocado are an important component of a healthy diet. Necessary for hormone and cell membrane production and essential for vitamin absorption and inflammation control, fats are an efficient source of food energy. While it’s now understood that it’s okay to eat butter again and snack on a handful of nuts, it’s still important to remember to limit your portions when trying to control your weight. Soups on – A trend that some describe as “souping” has replaced juicing in some circles. While some tout bone broth for its mineral and nutrient content, soups that are full of veggies which contain fiber, seeds and rinds provide critical nutrients for your gut microbiome, responsible for supporting your immune system. Fiber helps to control blood sugar and plays a key role in the health of your digestive tract. Nutritious and satiating, adding more soups to your diet may help to maintain a healthy weight, especially when loaded with veggies, beans or lean protein. Sprouted grains – Sprouted grains are whole grains that have been allowed to germinate. While once relegated to the health food store, sprouted grains are now showing up in cereal, pasta, bread and crackers. And, in addition to grains, sprouted brown rice, lentils, quinoa and mung beans are making their way into mainstream markets. While the research is still out on whether sprouted grains are more health promoting than whole grains, some studies show a wide range of health benefits including a lowered starch content, higher digestibility for sensitive systems and increased nutrients, including B vitamins, vitamin C, folate, minerals, fiber and essential amino acids. The beat goes on – While both beans and pulses are nutritional powerhouses, in order to heighten public awareness of the nutritional benefits of higher-fiber, higher-protein pulses, as well as to highlight sustainable food production, the United Nations has declared 2016 the International Year of Pulses. The term “pulses” is limited to seeds found within a pod, such as peas, lentils, beans and chickpeas, that are harvested solely for drying. According to the Food and Agriculture Organization of the United Nations, pulses should be eaten as part of a healthy diet to address obesity as well as to prevent and help manage chronic diseases, including diabetes, coronary diseases and cancer. Expect to see more products made with pulses, including varieties of hummus made with different types of beans and lentils, and baked goods made with gluten-free pulse derived flours. Plant based diets – A plant-based diet doesn’t necessarily mean a vegan diet; it means incorporating more plant foods into your daily meals. When the World Health Organization recently advised limiting red and processed meat consumption, people took notice. As part of the trend toward healthier, whole food eating, we saw a decrease in meat intake and an increase in plant-based protein consumption, as people shifted toward a more sustainable and nutritious variety of plant foods. And, perhaps most importantly, people are dropping the word “diet” in exchange for “mindful eating.” While many of us engage in “mindless eating” in front of the TV, while driving or working at the computer, mindful eating focuses on a conscious, healthy relationship with food. When you are in tune with your body, your hunger will make you aware when your body needs nourishment. Eating when you are truly hungry and not according to a schedule, and savoring and appreciating each bite is what it’s all about. It’s a simple commitment to choose foods with intention, to be present and to take the time to be grateful and enjoy your meals. Eating at a relaxed pace and focusing on taste and texture allows you to appreciate the food that is providing the fuel and nourishment your body needs for optimal wellness and function. With all our good wishes for health and prosperity in the New Year! This entry was posted in Home and tagged Full fat Dairy, Functional foods, Healthy Nutrition Trends Forecast for 2016, Low-fat anything is out, Plant based diets, Professional Supplement Center, Soups on, Sprouted grains, The beat goes on, Vitamins and supplements, www.professionalsupplementcenter.com. Bookmark the permalink.